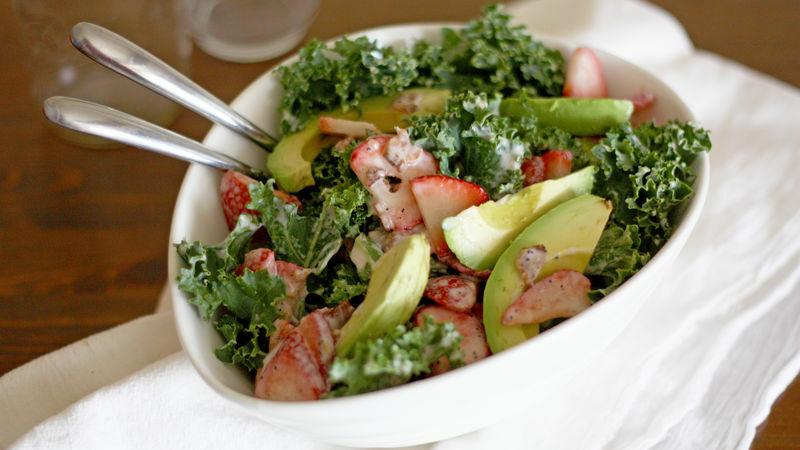 Measure out about 6 cups of torn kale; toss in a large bowl with sliced strawberries. In a small bowl, stir together crumbled bacon, Greek yogurt, sugar, vinegar, poppy seeds and salt and pepper to taste. Add to salad and toss to combine. Top salad with avocado slices and serve. Oh hey, I made a salad. Sorry to shout at you, but I just had to. Because when you’ve got a salad as delicious as this Strawberry-Avocado Kale Salad with Bacon Poppyseed Dressing to talk about, everyone needs to hear about it. You see, kale is all the rage right now. It’s the cool kid on the salad block. And everyone loves avocados and bacon. So when I happened across a lovely recipe from the lovely Lauren of Lauren’s Latest that combines ALL THE THINGS into one dish, I knew it had to be in my life, pronto. Now I know what you’re thinking: “If you put all the things together into one dish, that doesn’t mean it will taste good.” Au contraire, mon ami! This salad works. The sweetness of the strawberries plays very nicely with the saltiness of the bacon, and the creaminess of the Yoplait Greek yogurt pairs well with the creaminess of the sliced avocado. The kale also gives it a good texture and crunch. So, yeah, magical salad, right here. First, corral all your ingredients, including a bunch of fresh kale, a couple cups of sliced strawberries, an avocado, cooked crispy bacon and plain Yoplait Greek yogurt. Trim the stems from the kale and tear the leaves into bite-size pieces, then toss the leaves in a large bowl with the strawberries. To make the dressing, stir together the bacon (crumble it first), some of the Greek yogurt, some white wine vinegar and sugar, poppy seeds and salt and pepper. You’ll want to drink this stuff straight, but control yourself. The wait is worth it! Toss the salad with the dressing, like so. When you’re ready to serve, top the salad with sliced avocado. YUMMMMM. Let’s give this one a standing ovation. Stephanie (aka Girl Versus Dough) apologizes again for shouting. But seriously -- bacon. Check out Stephanie’s Tablespoon member profile and keep checking back for her own personal recipes on Tablespoon!